A common acute concern that is seen in the primary care, urgent care, or emergency department settings is urinary tract infections (UTI). UTIs are the most common bacterial infection seen in females in the United States.1 The majority of urinary tract infections are uncomplicated cases caused by Escherichia coli (86% of cases). History and physical examination are essential in cases of UTIs to assure that more severe etiologies are ruled out. Symptoms will often include dysuria, urinary frequency, and urinary urgency. Other symptoms that may be present include gross hematuria and suprapubic pain. Patients with the acute onset of dysuria with increased urinary frequency without vaginal irritation or discharge have a positive predictive value of 90 percent for the diagnosis of a UTI. For many patients, their symptoms will occur rapidly, or some may have poor access to care making it difficult to come in to be seen and evaluated by a healthcare provider. Two recent studies have shown that some women may be able to self-diagnose UTIs and safely be treated over the phone based on their subjective symptoms. Women who have had acute uncomplicated UTIs in the past are typically accurate in self-diagnosis when another UTI occurs.1 In this study, 84 percent of females indeed had a UTI that was confirmed by urine testing based on self-reporting symptoms. Physical examination in patients with a UTI is often normal. However, in ten to twenty percent of patients, suprapubic tenderness to palpation may be present.If a patient is ill in appearance with abnormal vital signs (fever or tachycardia) or presence of CVA tenderness, pyelonephritis should be considered. A common way to quickly diagnose a UTI is through the in-office urine dipstick testing. A urine sample with positive nitrites and leukocyte esterase are the most accurate findings of acute urinary tract infection in patients. For a full review of the analysis and evaluation of the in-office urinalysis, see my article, the Ultimate Guide to the Dipstick. However, I do not think anyone would blame a healthcare provider for completing urine cultures on a routine basis for routine UTIs, and in fact, other studies have shown that this school of thought allows for changing antibiotic faster in cases of microbial resistance and subsequently reduced rates of advancement to pyelonephritis. In my clinic, I regularly perform the latter, sending urine specimens for urine culture after the in-office dipstick shows findings consistent with a UTI, even if it is a run of the mill uncomplicated UTI, due to the fact what happens if you treat with Bactrim, but the offending bacteria is resistant to the medication you chose. The patient would not improve, and then you would have a recollect a new specimen, then send for culture, delaying appropriate therapy for an additional 48 hours at minimum. According to the Infectious Disease Society of America (IDSA) guidelines, no specific agent is considered the best for treating uncomplicated urinary tract infections.1 However, certain antibiotics are more favorable for treating the infection appropriately. Choosing an antibiotic should depend upon the local resistance pattern of your location, risk of adverse effects, and likelihood to cause long-term antibiotic resistance. Once therapy is started, patients will often begin to have resolution of symptoms within 36 hours of treatment. 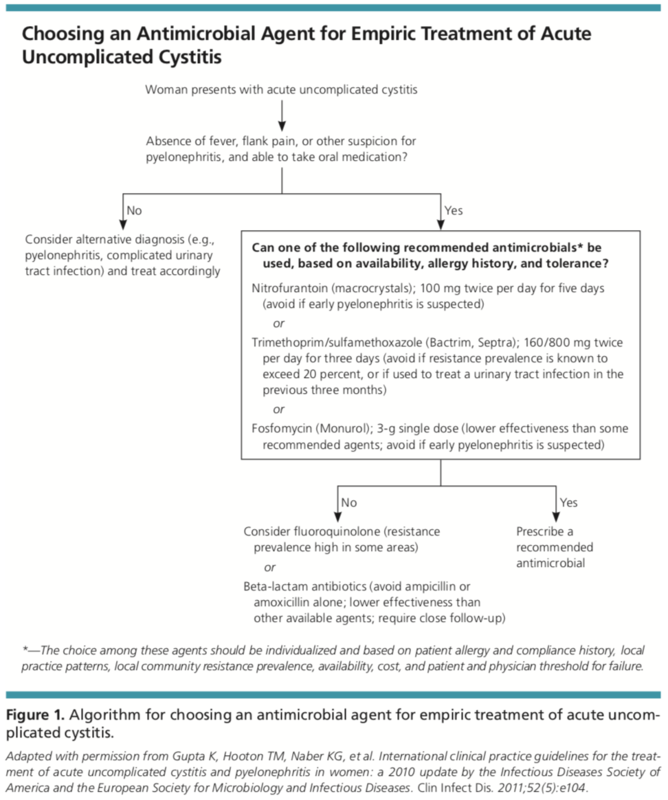 A decision model below can aid in the appropriate antibiotic choice. Nitrofurantoin should be dosed at 100 mg twice daily for five days. Research has shown that the shorter duration of therapy with nitrofurantoin of 5 days has been equally effective as the formerly recommended 7-day duration. Trimethoprim/sulfamethoxazole should be dosed at one double-strength tablet (160/800 mg) twice daily for three days in areas where resistance patterns are not higher than twenty percent. Fosfomycin should be a single dose of 3 grams. However, fosfomycin may be less efficacious and can be challenging to acquire. For example, I had a patient that was discharged from the hospital with acute kidney injury with a UTI that was found to be caused by VRE that was only sensitive to intravenous antibiotics or fosfomycin. The patient was given a prescription for the fosfomycin, but they had to travel an hour to find a pharmacy that had/could get this medication. Fluoroquinolones such as Levaquin or ciprofloxacin should be considered second-line options for treatment of urinary tract infections. These may be used in cases where a patient has allergies to first-line options for therapy or symptoms that are worrisome for pyelonephritis. Other antibiotics such as Augmentin, Cefdinir, Cefaclor, or Cefpodoxime can be appropriate options as well.2 Ironically the last quarter’s sensitivity report released by the hospital in which I work showed Augmentin to be the most effective antimicrobial for UTIs having a 98% sensitivity to the most common bacterial etiologies. As seen in a recent article (Antibiotic Overuse/Resistance), the rate of antibiotic resistance is a real issue that we have to face on a daily basis. This is no different with urinary tract infections.Beta-lactams are no longer recommended as first-line therapy for UTIs in adults due to increased bacterial resistance rates. Trimethoprim/sulfamethoxazole (Bactrim) is a common agent used for UTI treatment. However, there are instances when it may not be the best choice.If a patient has been on Bactrim in the previous three to six months, this has been found to be a risk factor for bacterial resistance to this medication. Another trial found that if a patient has traveled outside of the United States in the previous three to six months, and then they subsequently have a urinary tract infection, this is considered a risk factor for bacterial resistance to Bactrim as well. • IDSA. 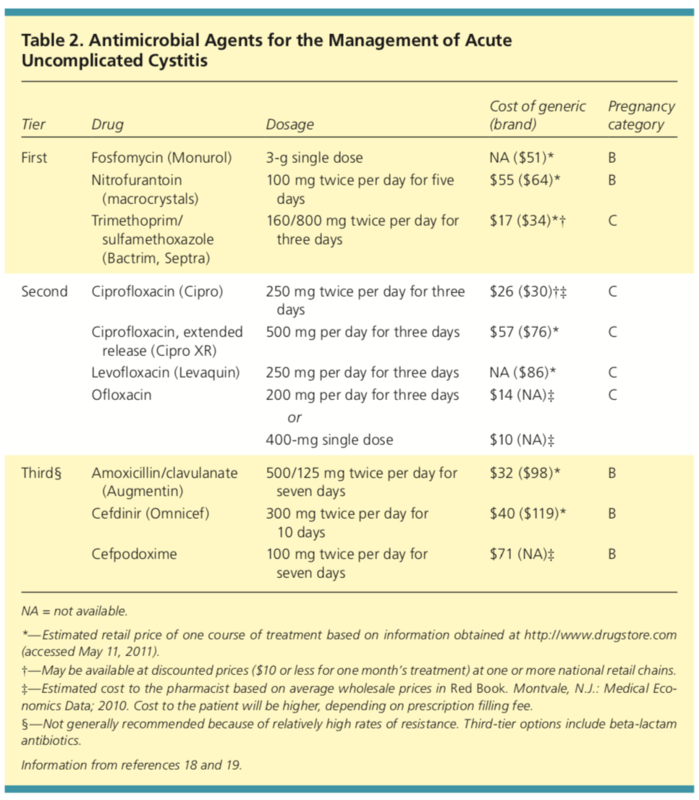 International Clinical Practice Guidelines for the Treatment of Acute Uncomplicated Cystitis and Pyelonephritis in Women: A 2010 Update by the Infectious Diseases Society of America and the European Society for Microbiology and Infectious Diseases. Accessed: March 20, 2018.